The first few days were really disappointing. It's supposed to be cheaper to live in AL so we thought that this move would provide us with a way to save money. We have already found a friend to rent our house for the next year so most of our House expenses will be covered. The rentals we looked at in AL during those first 3 days were awful. Not my idea of move in ready, dirty, dark, smelly, and dingy. Plus they were asking too much, in my opinion. We finally gave up using the property management companies and struck out on our own. We drove up and down almost every neighborhood in Jacksonville, Weaver, Alexandria, McClellan, and Oxford AL. We skipped the majority of the homes in Anniston because we have heard bad things about the schools there. We stumbled upon a couple of homes for rent by owner, two of which would be really close to Mr. Debutant's work. We were unable to get in to see them before I left on Monday morning though. I left the house picking up to Mr. Debutant, and he has made his choice. I just hope he made the right choice! Actually it sounds like the house he picked is a good fit: 3 bedrooms, 1 bath, large yard, allows dogs (without a fee), rent is not too expensive, in a good school zone, a short lease (in case we hate it) and no smoker smell! We don't smoke, never have never will. So walking into a home that has had smoker's is like a punch in the face. Anyway the plus side is that the landlord is pretty easy going and Mr. Debutant discovered that under all the carpet in the house there are lovely hardwood floors! The landlord has agreed to let us pull up the carpet! Yay! Ok enough House hunting stories. I haven't done much in the way of crafting this week. I got home on Monday afternoon, and have been trying to re-claim my "groove" since then: catching up on laundry, catching up on dishes (I hate doing dishes), working out, and gearing up for a yard sale on Memorial day. I don't think I will have much to share between now and the time we have to move. I have my triathlon in little more than 2 weeks! (June 6th) I can't believe it's right around the corner. So for the next 2 weeks I will not be traveling to AL with Mr. Debutant because now is the time I have to focus. Next week is my last hard week of workouts and the week after that is an easy "recovery" week leading up to race day! I did the main "pumpkin seed" quilting with my walking foot. It was much easier to go diagonally across the quilt rather than making "u" shaped rows of quilting and trying to pivot the quilt at the top of each "u." Did that even make sense? 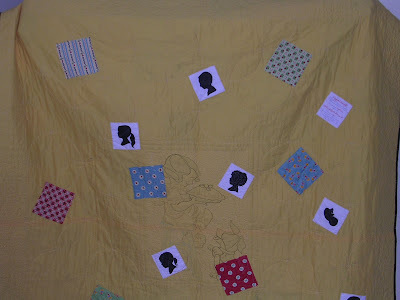 I free motion quilted around the center panel, outlining the girl and dog. I also free motioned the borders. You can see that I appliqued the silhouettes and extra charm squares onto the back. This quilt ended up almost twin size and was a beast to shove through my little Kenmore. But... no more!!! 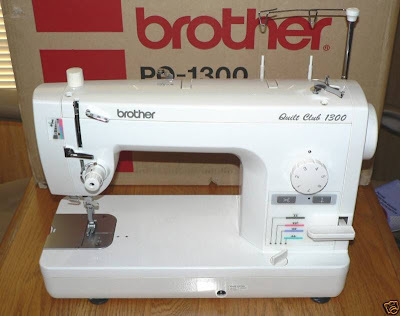 I scored a Brother 1300, which apparently is not sold anymore, but is the exact same as a Brother 1500 with one exception: it sews 1300 stitches per minute as opposed to 1500 spm. It has a 9" throat space and will work on my quilting frame! They also make a stitch regulator and speed control for this machine so I should be set for the next couple of years once I add it. I have no idea how much this machine costs. A Brother 1500 sells for $800 (the cheapest I've found) brand new. I can't imagine this machine being that much cheaper, maybe in the $700 range. I got it off of eBay for $350 with shipping. Score! Thanks so much for stopping by my blog and entering my giveaway!